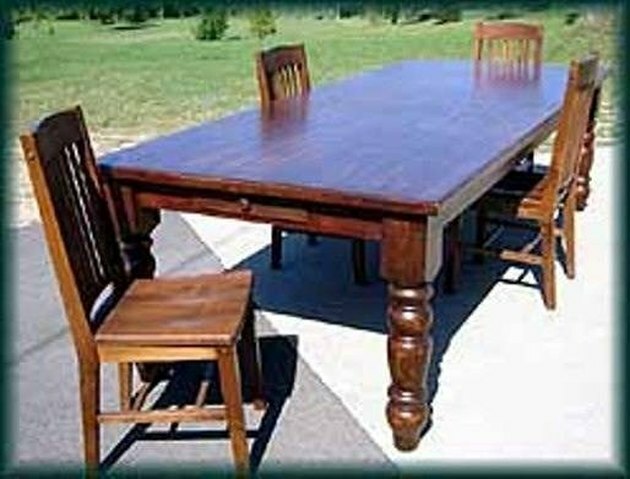 Refinishing a pine table is fairly straightforward as long as you have the right tools and workspace. It's important to read all the way through the directions so you have a good sense of the scope of the project before beginning. This can be a rewarding project that will spruce up your kitchen or patio. Sand off the old finish (varnish or paint). For worn finishes you'll need a coarse grit sandpaper, meaning a lower grit number, such as 60, to get down to the bare wood. For a less-worn table, you can start with a finer sandpaper, such as 100 grit, and take off only the top few layers of finish. Smooth the surface of the table using finer grit sandpaper. The type of sandpaper you use will be determined by the how worn the table is and how fine you want the finish to be. For a very worn table that is meant to look rustic, you should start with 60 grit, then sand with 80, and then with 100. For a finer finish, work your way up to higher grit sandpaper, such as 200. Clean the surface and surrounding work area of all dust using a vacuum. Just before you are about to apply the first coat of finish, clean the table with a tack cloth to remove any remaining dust. Apply the first coat of finish with long, smooth strokes parallel to the long side of the table. The first coat should be thin, and it's OKif you can see through it. Let the finish dry for 6 to 8 hours. Follow the directions for your finish to make sure you are allowing enough drying time between coats. Repeat steps 5 and 6 as many times as necessary to achieve the finish you want. For a table that needs more protection, such as a patio table, apply more coats.